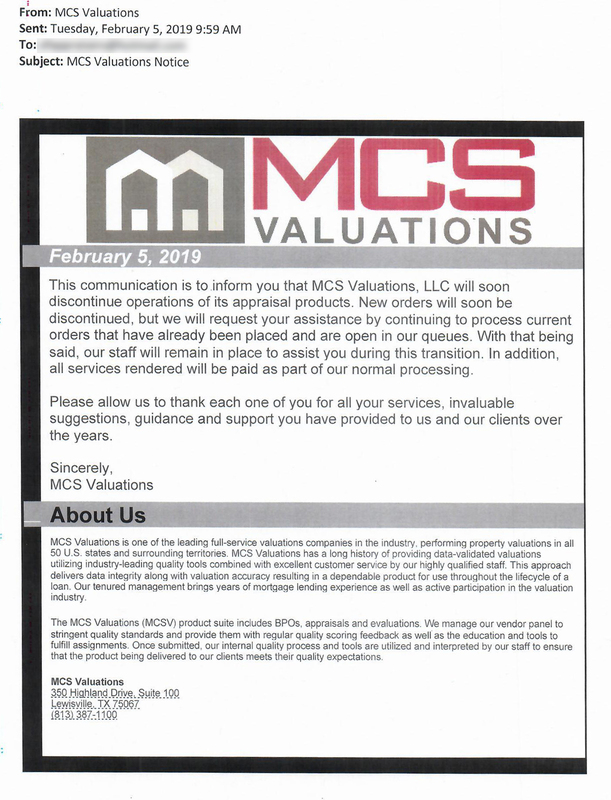 I saw a posting by another appraiser on a Facebook page on February 5, 2019 that MCS Valuations, based in Lewisville, TX, is closing shop. They are an AMC, and provide BPO’s and other real estate related services. The appraiser posted a letter from the company. They will not be placing any more appraisal assignments, but are asking appraisers to finish any assigned reports already in the pipeline. What’s really striking about this closure is that in 2014, MCS Valuations bought ‘components’ of CoreLogic’s associated entities that CoreLogic no longer wanted in their business! This communication is to inform you that MCS Valuations, LLC will soon discontinue operations of its appraisal products. New orders will soon be discontinued, but we will request your assistance by continuing to process current orders that have already been placed and are open in our queues. With that being said, our staff will remain in place to assist you during this transition. In addition, all services rendered will be paid as part of our normal processing. Please allow us to thank each one of you for all your services, invaluable suggestions, guidance and support you have provided to us and our clients over the years. On a side note, American Bankers Association submitted their support letter for the proposed residential real estate appraisal threshold increase. It’s not surprising that the American Bankers Association would wait until the last day to submit their SUPPORT letter for raising the de minimus to $400,000. That way, their submitted comments would not be seen on the Agency web site before the deadline date. You can read the American Bankers Association’s 6 page letter here or below. Depository institutions have access to, and currently employ, very accurate valuation tools. Our members perform valuations for residential portfolio transactions, home equity loans, and routine asset quality reviews. These valuations adhere to the interagency guidelines 7 and are assessed by the prudential regulators during safety and soundness examinations. If the bank provides an internal evaluation for the transaction, the cost is usually borne by the bank. Third-party evaluations cost approximately 50 percent or less than appraisals, and often result in meaningful and immediate reductions in consumer costs. ABA believes that existing regulatory oversight rules have the necessary safeguards to assure that depository institutions deploy proper control methods. We should start an AMC implode a meter, similar to the 2007/2008 lender one that was taking casualties daily! You know that never stopped… Dang, had not looked at that in quite some time… It’s different, but it’s still there. THEY changed the rules of the game. With the ABA’s stance on the $400,000 threshold reflects that it will be the banking industry that is going to start performing in house evaluations. The only question will be if they are assisted by AMC’s to complete these assignments. I have a local lender who inquired about how to sign up for our listing service which reflects that they will be doing evaluations on certain loans if not all loans. Very few properties they lend on are over $400,000. Banks will now have commissioned staff doing the evaluations. Bank managers. Parking lot attendants, receptionists. Whoever is handy. They MAY use AMCs and I hope that if they do NOT ONE appraiser will buy into the crap. WHY undermine our own profession? Expect these exception numbers to jump substantially when the demins are raised. FNMA makes it easy for lenders to bypass traditional and logical checks and balances requirements. I can honestly see why lenders would want to hire their own staff appraisers. They will be able to provide a much better service for their clients than we can provide them today. Do to the middle mans underwriter who wants an extra comp and more comments irrelevant to the value. Unfortunately this is not our doing but we were forced into our situation. Maybe I can become a staff appraiser for several lenders in hopes to supplementing some income while I find other avenues of work. Something has to give and it looks like banks are going back to the days before the S&L crisis with a new start. As an appraiser I hope I can assist them in evaluations and too get back to the days before all this bs with AMC’s that has bogged down the process. When lenders outsource appraisals to independents, while simultaneously avoiding the use of amc’s, it’s the best of both worlds from an appraisers perspective. What makes you think having a lender as your boss directly will provide you any relief? JW – MOST used to do just that. The problem is twofold. (1) The administrative overhead and personnel costs are through the roof (compared to AMC costs); and (2) the mythical firewall between commission staff and appraiser is harder to pretend when the appraisers are in-house. Plausible deniability also disappears when the appraiser is on staff. Banks have become used to eliminating that overhead. Just like they eliminated tellers by using deposit machines. They may go to platform management systems but don’t anyone be fooled into thinking there is any independence with those either. The lenders get to populate their own panel appraisers. They’ll be able to dump appraisers from it without the appraiser ever being the wiser. It is a shame and I hold AMC’s responsible for where we are today. They turned their middle third party service into a telecommunicator operation with low wage personnel with cumbersome upload services like ACI which seems to be a lot better than it once was. Counting down, 34 more months left in this biz ! Hopefully only a couple more for me. I’ve had it. Once again! Millions of dollars in appraisal fees squirreled away in overseas accounts. I don’t see this whole fiasco as the AMC’s fault, although many are arms of lenders (Corelogic) I see it as greedy bankers and mortgage brokers doing, as well as our ELECTED representatives who first instituted Dodd Frank. It’s always about the money. Amazing the attitude post – Savings and Loan crisis of the early 1990’s vs today; we are no longer, in their view, needed. Nothing has changed about the nature of credit or lenders, yet greed has been taken to new levels; cut out the only non-biased entity in the equation. Prepare to place one’s head between ones knees. Did you ever hear of a company called XAIO? Clarocity’s ‘relationship’ / ties to XAIO should be all anyone ever needed to know about them. Previous story What’s Happening With the New Forms? Appraisal What’s Happening With the New Forms?